According to Jason Ross, Marketing and Communications Officer, the visit is all part of Responsible Wood’s outreach to improve recognition of PEFC forest certification within the New Zealand market. “As it stands up to 500,000 hectares of New Zealand forest area is now covered by the New Zealand Standard for Sustainable Forest Management, with more than 30 New Zealand businesses now scheme holders under the New Zealand Chain of Custody Standard for Forest Products,” Mr Ross said. This marks an impressive milestone for PEFC in New Zealand. After two years since the establishment of the New Zealand PEFC forest certification, the New Zealand standard for Sustainable Forest Management now covers more than 27% of all New Zealand planted forest available for production. The New Zealand standard for Sustainable Forest Management has become an important benchmark for sustainable forestry. “Responsible Wood is working with stakeholders to improve Chain of Custody registrations and build on New Zealand forestry currently under certification; we have had interest from foresters looking to develop group forest management schemes all through New Zealand,” Mr Ross said. PEFC and Responsible Wood certification remains critical for the timber export market, none more so than in one of New Zealand’s largest timber export markets – South Korea. Simon Dorries, Responsible Wood CEO, has been impressed by the response of stakeholders to the call for nominations to participate in the Trans-Tasman standard review committee. 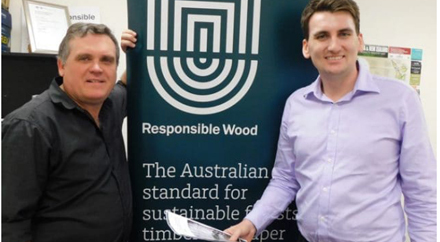 “Responsible Wood has fielded considerable interest from stakeholders both in Australia and New Zealand; the interest from New Zealand stakeholders in particular has been greatly encouraging,” he said. Responsible Wood will also attend the New Zealand Wood Processors and Manufacturers (WPMA) Conference in April. Hosted in Christchurch the conference will draw timber and wood processors from across New Zealand. “In terms of investment, growing the pool of Australian and New Zealand businesses certified under the Chain of Custody standard is a must,” Mr Dorries said.